The University of Toledo Women & Philanthropy Genetic Analysis Instrumentation Center will be unveiled Thursday, May 17, at 6 p.m. with a ceremony in Health Education Building Room 100 on Health Science Campus, followed by tours of the facility located on the second floor. The center, which increases the capability of UT researchers in the College of Medicine and Life Sciences to develop preventative, diagnostic and treatment strategies for diseases such as cancer and heart disease, was created with the help of nearly $60,000 from Women & Philanthropy, the largest grant ever awarded by the volunteer organization that supports UT initiatives. 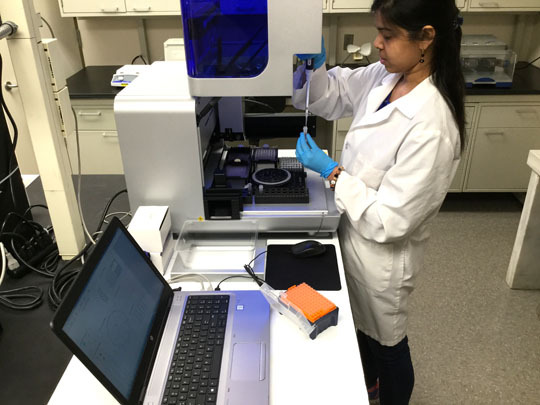 A researcher works in the Women & Philanthropy Genetic Analysis Instrumentation Center. “We are extremely grateful for the significant investment provided by Women & Philanthropy to establish the center, which will greatly enhance our capability to investigate numerous diseases and develop potential therapies,” said Dr. Steven Haller, assistant professor in the Department of Medicine and co-director of the new center with Kennedy. The researchers recently received three grants totaling $450,000 from the Ohio Department of Higher Education to support their water quality research into how exposure to algal toxins, such as microcystin, affects organ function and to create new therapies to prevent and treat organ damage, especially in vulnerable patient populations. • Real-time multiplex polymerase chain reaction thermal cyclers that use a centrifugal rotary design to allow each reaction tube to spin in a chamber of moving air, which keeps all samples at each step of the cycling program at exactly the same temperature. The system contains integrated Q-Rex software for data integration and analysis. This entry was posted on Tuesday, May 15th, 2018 at 3:55 am and is filed under Advancement, Events, Medicine and Life Sciences, News, Research, UToday .